[By Nick] Besides a few scandalous requests, I actually do enjoy reading our review request form. It gives me an idea of what you guys are looking to see as well as tipping me off to brands I’ve never heard of. In fact, the request form led to today’s review of Halo Top Creamery. Never having heard of them before, I made my way over to their website to see what they were about and where I could find them. Of course, seeing as I live in the middle of nowhere, no one close carries them. A few emails later with a Halo Top rep (who's been a fan of the site for years) and every flavor in their line up appeared on my door step. So who is Halo Top Creamery? Well, they’re a company trying to produce a healthier ice cream. They’re high in protein, low in sugar and only use all-natural ingredients. If you’re like me and see “protein” as one of the selling points, horrible flashbacks to Arctic Zero might pop up in your mind. Honestly, Arctic Zero is their main competition but the difference is that Halo Top is able to call their product ice cream so they’re already ahead in my book. All of their flavors except chocolate have just 70 calories per serving. The chocolate comes in at a “heftier” 80 calories. Technically speaking, I’d be able to eat every pint and still take in fewer calories than a full pint of select Ben & Jerry’s flavors. Not too shabby all things considered. Okay, let’s get to this! Since Halo Top refuses to use artificial softeners, I was told to either let the pints temper for a few minutes or to microwave them. I believe microwaving ice cream is one of the deadly frozen sins, so I’ll just let them sit out on my counter like a fine gelato. Well that’s not how I wanted to start this one out. It looks as if both pints of Halo Top Vanilla Bean ice cream didn’t do too well on the journey to my house. I really hope this isn’t a sign of things to come. I’m actually hesitant to even try this one but hey, they sent these over for me to try so I must press on. Okay, I have good news and bad news. The good news is that the flavor hasn’t been affected at all. It has that classic vanilla bean flavor with a little bit of egginess to it. 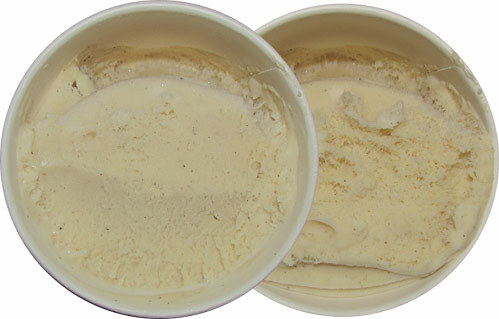 Halo Top has managed to fuse the flavors of vanilla bean and French vanilla to produce a very solid vanilla. The bad news (which I’m blaming on the shipping) is that the texture is off. 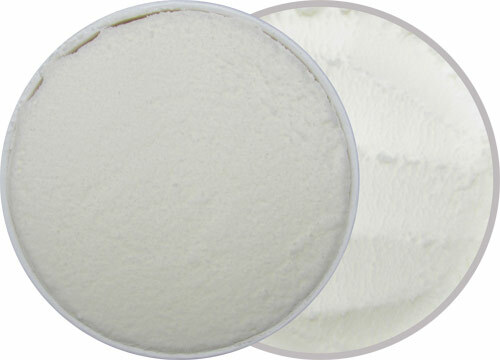 Some parts are very creamy for a low-fat product but others are frozen blocks. The texture is going all Dr. Jekyll and Mr. Hyde on me and it takes away from the flavor. If the texture is normally all smooth, I’d say Halo Top has one of the best “healthy” vanilla flavors on the market. Let’s move onto their chocolate flavor and see if it was able to arrive intact. Okay, Halo Top Chocolate ice cream looks good right off the bat. The chocolate base has a rich color to it which I highly appreciate but the taste doesn’t match up. To be honest, it kind of tastes like how I would imagine dry, hot chocolate mix would taste. It even leaves your mouth dry as I’d expect hot chocolate mix would do (trust me, I’ve never tried it). I’m guessing this comes from the “high fat cocoa” in the ingredient list. The taste itself isn’t all that bad especially for such a low fat option but it does come off as a bit flat. I was informed that I had received the old formula and they are in the process of transitioning over to the new one. I’m thankful they already took action because overall this was one of the worst ice creams I have ever had. If you try the new batch, let me know how it is! It’s time to complete the Neapolitan trifecta with Halo Top Strawberry ice cream. I’m not sure why but both pints they sent me appear to have experienced massive shrinkage. Instead of being full they both looked as if they were compacted from all sides. At least this one doesn’t look as bad as the vanilla did. The shrinkage actually made the ice cream denser than the first two, but sadly the flavor is pretty mute. There are hints of strawberry but it’s not all that strong. I love strawberries so this is a bit of a disappointment. That said, I have had Arctic Zero’s Strawberry and would say that this one is better. That’s what they’re aiming for so I guess that’s a positive. Last up is the “odd” one of the bunch: Halo Top Lemon Cake ice cream. I guess I spoke too soon when I said Haagen-Dazs had the only lemon ice cream base on the market. This one seems to be the most promising aroma wise since it smells like a fresh squeezed glass of lemonade. Scooping some out, this one scoops the smoothest of the bunch. This transitioned over to the mouth feel as well. 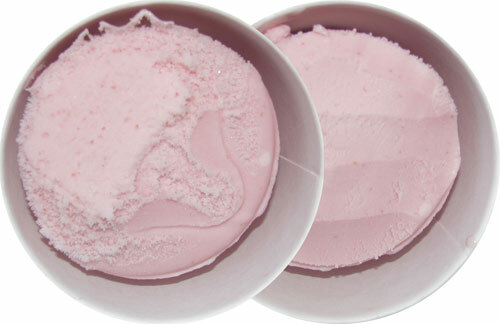 While you won’t mistake it for regular ice cream, there is some familiarity to the texture. Looking over the description, they akin the texture to cheesecake and I’d say they’re not all that far off. The taste is very pleasant and reminds me of a fresh lemon mousse. I might even go as far as to say its almost reminiscent of a lemon meringue pie, albeit one lacking tartness. In fact, I feel like Halo Top should have named it that instead. The lemon flavor isn’t overbearing and reminiscent of B&J’s Liz Lemon. You could easily down the whole pint without even noticing it’s that good. With only 280 calories in the pint, you won’t feel bad about it either. All and all, this is easily my favorite flavor of the bunch. Vanilla Bean: Damaged in shipping, flavor great but the texture was off. 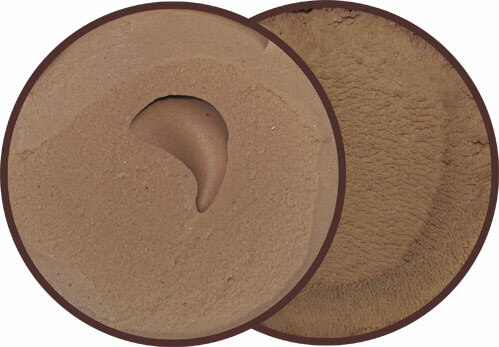 Chocolate: Being reformulated but currently tastes and feels like hot cocoa mix. Strawberry: Also damaged in shipping. Flavor was very mute. Lemon: The best of the bunch. Tastes like lemon mousse, feels like cheesecake. As you can probably tell, I’m not a part of Halo Top’s target market but they do have a couple of flavors that I’d be willing to pick up on occasion. If you ever see Halo Top in the freezer section, don’t hesitate to grab their Lemon Cake or their Vanilla Bean. I wouldn’t recommend the Strawberry or the Chocolate flavors though. I have no idea how their new chocolate will be and there’s just too many better strawberry options out there for what they’re aiming for. I would just like to thank Halo Top for the opportunity to try out their line and hope they do well enough to get Arctic Zero off the shelves. That would be a victory for all of the frozen dessert world. The vanilla sounds promising. I would definitely try it if I ran across it in a store. Anything has to be better than Arctic Zero! By any chance do you remember how many grams of sugar the vanilla had per serving? The Lemon one is so good. Bought it the other day, cant wait to try the others! @Erin: That stuff is really good. Let me know what you think of the others. I'm curious to how the chocolate is after reformulation and the vanilla/strawberry without the damage from shipping. I have to agree, the lemon is very good, light and creamy. I also tried the strawberry and felt it was to hard and icy even after letting it sit out. 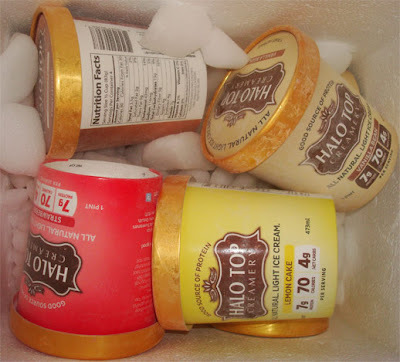 I was not a fan of Arctic Ice at all, and was hesitant to purchase Halo especially at almost $6.00 at Whole Foods. I will try the vanilla, I love chocolate but will probably stay away from it. Lemon gets an A from me for a low cal,carb and sugar ice cream.I wish the price were lower though. I Tried Vanilla And Lemon. Definitel A Huge Fan. Found It At My Local Fresh And Easy. Great Fot My Weekly Ice Cream Treat. Amazing In A Waffle Cone. I think it gave me gas. I liked the lemon cake, and I kind of like the chocolate, but I ate 2 servings yesterday afternoon and I had gas all evening. Honestly- I totally agree about Arctic Zero! It is so nasty! I don't understand how people can like it.. to me it tastes like water. I love Halo Top! I also enjoy Yasso bars! They are my absolute favorite. I tried the Lemon Cake flavor last night. I bought it from Earth Fare (similar to Whole Foods), and it was on sale for buy one get one free at $5.46. This was a huge plus as this puts the price lower than almost any other ice cream, not to mention this is "healthy/specialty" and would normally be very expensive. Overall I would say it is excellent. Keeping in mind that it is a healthy option. The texture was good, but very light. You have to let it sit out and soften so it's not rock hard. The taste was a little more tart than I would have liked. I expected it to be more of a creamy lemon flavor, but it was more of a sour lemon flavor. However, I really liked it for being a low sugar option and will buy it again. Maybe next time I'll try vanilla. Love the chocolate! It tastes like real ice cream. I'm throwing the vanilla in the garbage. It's uneatable. Tastes like chemicals. I think the Vanilla Bean has been reformulated as well. It's AMAZING. So is the "new" Chocolate. I also think you need to buy them in a store, take them home, and put them in the freezer. They don't take long to soften enough for scooping. One scoop is all you need. The flavor is rich and dessert shouldn't be "the whole pint". This is my favorite low carb ice cream. I just wish it had more FAT. I love the Chocolate and the Lemon Pie. I'm totally bummed that Sprout's has discontinued...they only carried the two flavors. I bought all the Chocolate flavors from the Orange County stores at $2.49 a piece...regularly 4.99. The manager told me he'd special order a case for me and keep it there if I wanted. I picked up the Vanilla at Fresh & Easy a while back and it was all dried up and had the "shrinkage" the review spoke of. Probaby too long on the shelf. Haven't tried the Strawberry yet. Drove to Sprouts to pick up some Lemon Cake and they were all out. As Kim said, it's been discontinued. They didn't offer to special order any, but I will be calling tomorrow to see if they will. I bought 5 of the chocolate, but think I need to go back tomorrow to get the rest. I'm diabetic and try to eat low carb; this was a nice treat. Kim, did you have him special order it for you? @Kim & @B: if all else fails, there is always http://www.icecreamsource.com/Halo-Top-Creamery_c_446.html. Have either of you tried iskream or clemmys? http://www.onsecondscoop.com/search/label/clemmys Just remembered, I think Wegman's has Halo Top. One reviewer mentioned problems with gas; it is most likely the fiber content. The nutrition facts list 5 grams of fiber per half cup. I usually eat 1 cup and had similar issues at first. I think it just takes time to get your body used to it. After buying a couple of pints of Arctic Zero and literally spitting it out (I have no idea how anyone can like Arctic Zero), I was a little wary of trying another low-cal high-protein ice cream. I'm so glad I did. I totally love Halo Top vanilla ice cream! I got a coupon for a free pint at Kroger. They had chocolate and vanilla and I chose vanilla. I was surprised when I opened it to see almost an inch of space between the ice cream and the lid. It was also very icy. I put a little amaretto on top and that helped soften it. Five minutes later when I ate it, it was still very icy to me - not creamy at all. I don't know if I got some that wasn't keep right or if that's the norm as I see conflicting comments. I wish it were at least a little creamy, then it would get a thumbs up! I also got a coupon for a free pint at Kroger and chose vanilla. It was soft enough to eat straight out of the freezer, but the texture was still strange and left my mouth feeling dry. And I love stevia, but this was too sugary tasting for me (tasted like very sugary/icy soft serve). I wouldn't buy for actual cash money, but it was a ground-breaking experience for me! I recently discovered this brand and have tried the 4 flavors and agree on the shrinkage (and I purchase it 5 mins from home). Consistently with the vanilla and strawberry. Flavor wise, lemon is my fav, straw next. The chocolate was good, not that flat but not that great, but the vanilla had the most "artificial" taste and funky texture, I wouldn't buy it again. ALL are Way better than Arctic Zero which I found to be just horrible, like whey protein and water, and frozen...for years. Whole Foods is the only game in S. Florida for this brand. It's def a winner, especially for this ice cream addict. I have been trying to stay away from Haggen Daz because of the calorie and fat count, although it is the gold standard for my taste buds (especially since Frusen Glade left the scene). So, to keep the calorie, sugar and fat count down, I have been frequenting a popular frozen yogurt establishment in my area. Yesterday, I discovered and tried the Halo Top Vanilla Bean. I absolutely loved everything about it - taste, calories, fat, and protein count. As a matter of fact, I loved it so much I woke up this morning thanking God for allowing me to find it! I also think the company is appropriately named!! Oh, one other thing, because of the protein count, I can't wait to include Halo Top in some of my smoothies. The lemon cake is amazing! I can't get over how good it is. Please let it not be discontinued! Bought a pint of chocolate and vanilla bean to try today. I sampled them both and have to agree with the reviewer about the chocolate. Vanilla bean had a very strong and sweet taste. Kind of bummed I didn't also buy the lemon as well. Someone mentioned that these caused some gas. It is likely due to the sugar alcohol used for sweetening (erythritol), which tends to be much easier on folks than other sugar alcohols (maltitol, for example) but can still cause some gastric issues with people sensitive to it. I tolerate this particular sugar alcohol better than any other but in excess, it can give me gas as well. It isn't only a matter of "shrinkage", which I encountered in 2 of the vanilla pints recently purchased at Whole Foods. It actually looks as though the contents have been tampered with. And the weight is off - the one pint I kept (having dicarded the other because it looked too much like someone had already eaten some!) weighed only 9.95 ounces, compared to a "full" pint of lemon at 11.25. Delicious product, but seriously flawed production standards. Love the chocolate!!! All the pints I've purchased and ate (close to five) have been surprisingly delicious. I do wonder though if it is too good to be true with the erythritol and probiotic fiber that may come from genetically modified corn. I grapple with whether it would it be better to just eat an ice cream with real food ingredients? I've read studies that indicated these other methods of creating fake foods actually increase the cravings for sugary products. Some mentioned that they got gas from this ice cream but my experience was much worse. I at a cup of vanilla and was in the bathroom 5 times over the next few hours. Maybe I am sensitive to the sugar alcohol more than others. The flavor was good but I don't think I can go through that again. I stumbled across a Halo Top chocolate completely by accident at Wegmans; someone had put a pint in with the regular ice cream. I let it thaw for about 45 minutes before consuming. Texture-wise, it seems dry to me. If you let it sit in your mouth for a second, it does become creamier. The one issue that jumped out at me is that you said the chocolate is 80 calories per serving; mine says 60 calories per serving. Is Halo Top fudging the facts? I was following HaloTop on Instagram and grew tired of their constant posts featuring all these "other" flavors that NOBODY ever seems to have tasted...and which never seem to be available to the general public. "Birthday Cake"? Sounds nice, but.....yeah. Missing in Action. That annoys me because whoever manages the HaloTop Instagram account never responds to the inquiries and they seem to just flash these pix of their products but don't feel the need to be bothered by customers actually asking relevant questions. Rant aside, the Lemon Cake is the best by far....of the FOUR basic flavors that are only ever available ANYWHERE (that is, Chocolate, Vanilla, Strawberry, and Lemon). Guess I'm spoiled by manufacturers like AboutTime (protein powder and related) who produce non-GMO, "clean" products that I use, and who take the time to reach out to customers when asked a question, and their service ethos is top notch. I just realized that I will now very likely just make my own "protein" ice cream, since I typically use Birthday Cake protein powder (AboutTime) for my daily post-workout shakes and I've asked HaloTop what's up with always featuring it on their Instagram but they never respond, and once, someone (from HaloTop I believe) actually scolded me when I expressed skepticism about availability -- yet, did not clarify situation. Rant now officially over. Peace out! Way too expensive. I f Hagen-Daz is a 10 Halo Top is a five. jadedmuse, I just bought the birthday cake flavor at my Kroger. I live in KY. I haven't tried it yet. But, it does exist. They also had cookies & cream. Have you tried the new flavors? Costco has Vanilla and Birthday cake in four-pack boxes. I tried the Vanilla just a little bit ago this afternoon. It's got that artificial sweetener aftertaste which I'm not fond of but overall the texture was still creamy and good vanilla flavor. Some hot caramel over top made for a nice sweetness boost and hid the sweetener aftertaste enough to make it tolerable. It's not something I'll buy again but $14 for four pints was a fair risk to try it. Halo is made with erythitol. How anyone would consider that a natural ingredient I don't know. I'm trying to find out if any of it is made from non-GMO sources, but it doesn't seem so. So that means that the third ingredient in the product is processed from extremely genetically modified ingredients. It's fine to not like GMO stuff, but I'm not sure what you think erythritol is made of? I personally avoid erythritol because my insides are not a fan of it.